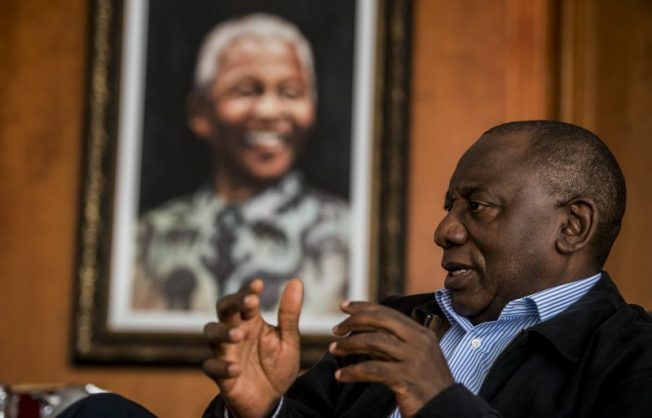 South Africa’s freshly-appointed president, Cyril Ramaphosa on Friday hailed “a new dawn” as he pledged to tackle the corruption that his predecessor Jacob Zuma is accused of fostering. In his first major speech after Zuma’s bruising nine-year term ended, Ramaphosa outlined a grand vision to revive the stagnant economy, address dire unemployment and control spiralling government debt. “We should put all the negativity that has dogged our country behind us because a new dawn is upon us and a wonderful dawn has arrived,” Ramaphosa told parliament in the annual State of the Nation address. In his first full day in office, Ramaphosa won loud applause and cheers from many ANC lawmakers who were fiercely loyal to Zuma throughout his turbulent and often divisive presidency. Zuma was forced to resign on Wednesday after the ruling African National Congress finally turned against him, with pro-business reformist Ramaphosa sworn in as president on Thursday. After multiple corruption scandals, economic slowdown and falling popularity with voters, the ANC had threatened to oust Zuma via a no-confidence vote in parliament. Zuma resigned reluctantly, complaining he had received “very unfair” treatment from the party. Opposition parties reacted warmly to the speech. The liberal Democratic Alliance applauded business-friendly policies, and the radical opposition Economic Freedom Fighters cheered pro-black land redistribution plans. “The last positive speech of this sort that I heard was in 1994 when Madiba spoke,” said Narend Singh, chief whip of the Inkatha Freedom Party, referring to Nelson Mandela. Ahead of the speech, he told journalists he was “a little bit excited, expectant, a little apprehensive”. Among the immediate challenges he faces are a gaping 50-billion-rand ($4.3-billion/3.44-billion-euro) deficit, the threat of further credit rating downgrades, and 26.7-percent unemployment. “We will be initiating measures to set the country on a new path of growth, employment and transformation,” he said, giving few policy details. Eurasia Group analyst Darias Jonker predicted that Ramaphosa would remove many Zuma loyalists from the cabinet, but only after the budget speech on 21 February. “(He) will also go after high-level corruption, particularly the Gupta family and their associates, which include members of the Zuma family. This campaign will greatly contribute towards restoring investor confidence,” Jonker said. The Guptas are a business family from India who formed allegedly improper ties to Zuma. They are accused of receiving hugely favourable government deals and even influencing cabinet appointments. The COSATU trade union federation, an ANC ally, called on Ramaphosa to cut back the executive and crack down on government excess. “Bling lifestyles of the political elite at the expense of the taxpayer must be stopped,” it said. Ramaphosa’s appointment saw benchmark South African stocks score their biggest gains since June 2016 while the local rand currency reached its strongest level against the US dollar in three years. In previous years, the EFF party had disrupted Zuma’s State of the Nation speech with its lawmakers walking out — or protesting and then being physically ejected from the chamber. On Friday, though, the EFF remained in their seats to listen to Ramaphosa’s speech. Zuma appointed him deputy president in 2014.